A few more DVDs and a few more vintage Paperbacks. Priced & shelved a few stacks of hardcovers. Moved the Paranormal Romance to an easier to see spot, moved the Mythology over one shelf, and expanded the Horror & Series Romance paperbacks by one shelf each. Started pricing collectable paperbacks in preparation for the Paperback Show on March 30th. Revised the tri-fold pamphlet some more. Sent off my absentee ballot. Packaged up 10 online orders. Sent out an email to the A Castle of Books email list with a special Valentines day Coupon. Some young adult books, old text books and 1990 era playboys came in. 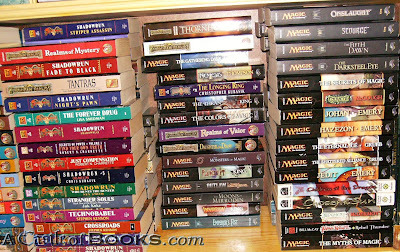 Finished pricing/shelving/listing the last of the RPG books, just have some card games left to do. Shelved some movies, DVDs & VHS. Made up some more sets of RPGs, some Dead Lands, In Nomine, Silver Age Sentinels, Jack Vance's the Dying Earth, took all day, bah. Pricing/listing/shelving more RPG stuff, and some odd-ball war game packets, only got a few done, still have about half of them left. Roger of Once Read Books dropped off more comic book donations. Fiddled with eBay shops a bit. Fixes to the map-flyer, printed out a couple copies. Diamond shipment arrived, more Manga, some Frank Brunner, toys & a Pulp Mags book. 11 online orders, let them sit a day longer trying to get a priority, so they built up a bit. Shelved 3 boxes of paperbacks, quite a few newer fiction, romance (supernatural & not) , and some mystery. Did a few more bills. Pulled & condensed the Health, Self-Help, Parenting, & Education by 3 shelves. Moved the Parenting to near the bottom of the health section, moved the Education below the self-help. Expanded the cookbooks by 3 shelves, and just about filled them already. Shelved (6) boxes of Cookbooks. Made a big pot of turkey chili w/beans. 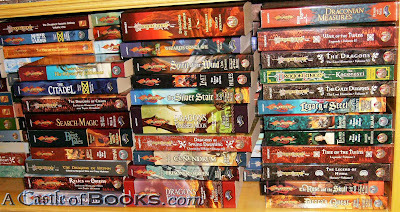 Sold a stack of HB D&D books. Wasted all day with this stuff. Some trades in today, little bit of politics, history, historical fiction, cookbooks, medical, & The Secret. 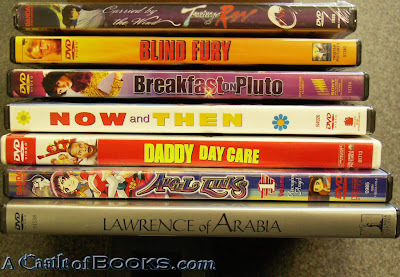 More VHS tapes, some CookBooks to the shelves & some to the $1.00 section, Vampire Romance. Revised the tri-fold pamphlet & printed a few copies, and gave most of them out already. Shelved another large stack of RPG stuff, mostly Fantasy d20 system, but started into the SF RPGs and the other game system stuff. 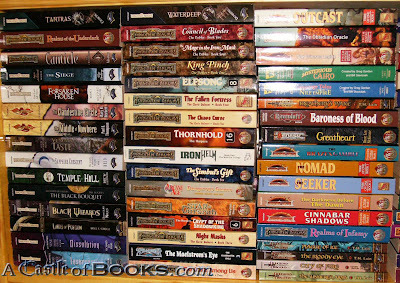 Shelved another couple of stacks of RPG books, all d20 System Fantasy Role Playing Game books. Cleaned out the 3rd aisle a bit, shelved more paperbacks. Bought a stack of used Manga, including a large run of Naruto & Bleach. Couple of eBay shops orders, some game cards. 4 other online orders made for a very nice online sales day, but not much in the store. Finished marking down the cookbooks, lots of $3.95 cookbooks now. Marked down the Health & Medicine books - lots of them to $3.95. Shelved more Role Playing Games. A few Cookbooks, and some Health & Medical books went onto the $1.00 racks. Fresh Cookbooks & SF on the $1.00 books shelves. more newer paperbacks on the spin racks - a large stack of paranormal romance. Worked on eBay shops adjustments, fixed the shop categories, and some of the eBay categories, mostly for the toys. Wallpapered the bathroom with more book cartoons. Marked down some of the Cookbooks, quite a few went to $3.95, I'll try and finish the rest later. resubmitted online ad for LA Weekly. Trades today contained a bunch of that Supernatural Romance which has become so popular again. I'll try to get it shelved soon. Rearranged the comics in the kids section - expanded into 2 of the racks I picked up from Game Castle - and managed to get some extra room for the young adult paperbacks. Worked on the eBay Shops more, I knew it wouldn't be as easy as I'd hoped. Also signed up with A1Books & Valorebooks. Damn, someone from the city came by and said I can't have the roof-top sign. The whole crew from Sunshine Books stopped by on their way back from Disneyland. Shelved more RPGs, Toys, Games, and Figures. 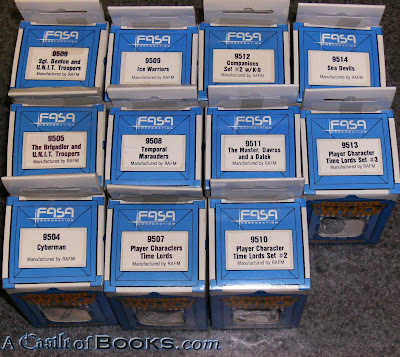 Including a Batch of Doctor Who Miniatures. Put up some shelves in the kitchen. Started shelving some of the RPG books. 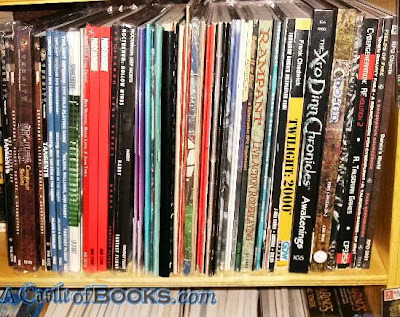 Started on the Role Playing Game Books - lots of d20 fantasy, tons of D&D supplements, some SF, some Judge Dredd, Slaine, lots of various others. Almost all of the RPG fiction that was picked up Tuesday has been shelved, lots of DragonLance, Forgotten Realms, Magic the Gathering, BattleTech, ShadowRun, and much more. The author of the Flashman novels and screenwriter of Richard Lester's Musketeer movies has died. Had a lot of Romance paperbacks traded in. Went back to Game Castle to pick up the magazine racks purchased yesterday. Went to Game Castle's last day Auction. 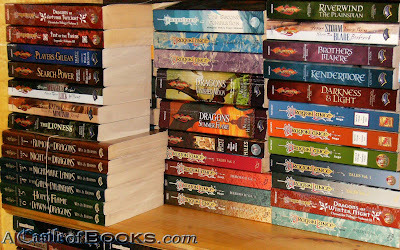 Picked up most of the novels, tons of TSR/Dragonlance, Forgotten Realms, etc. Also some card games and a few other odds & sods.